The Stedfast Association was launched at the Royal Albert Hall in 1983, and exists to enable former members and supporters to keep in touch with todays Boys' Brigade. It provides practical support, valuable assistance and countless new friendships have been made and many new international links formed. The worldwide "Family" of The Boys Brigade has been strengthened by the growing influence of the Stedfast Association which has developed into a fast growing international organisation with many thousands of members worldwide. Each Association is a fully autonomous local body with its own office bearers and organising its own varied activities. 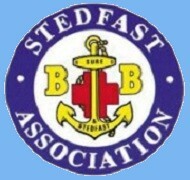 Each Association maintains close contact with its local BB Battalion or District and are members of the Federation of Stedfast Associations United Kingdom & Republic of Ireland.